Due to the shortage of fossil fuel and the environment concerns, the green energy industry and related industries will become the main stream in the coming 30-50 years. Therefore, the application of the renewable energy has attracted more and more attention. That causes the strong demand of rechargeable batteries. However, the existing lithium ion cell systems including lithium cobalt oxide and lithium manganese oxide still suffer from low discharge rate, safety concern and short cycle life. 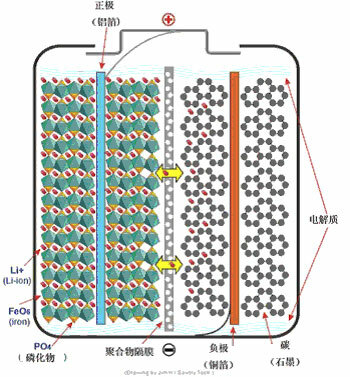 To solve those issues, Evpst battery has successfully developed a new lithium ion cell by using lithium iron phosphate as cathode to fulfill the above requirements. High Performance --- High theoretical capacity of 170mah/g and high practical capacity as high as 165mah/g. Extremely Safe/Stable Chemistry --- High intrinsic safety , no explosion & will not catch fire under collision, over charged or short circuit. High thermal stability of phases up to 500C. Extraordinary Long Cycle Life --- Best can up to 3000 cycle life , would be over 8~10 times life of Lead Acid and 3 times of NIMH. Flexible Form Factor --- Small in size and light in weight 1/3 weight of Lead Acid and 65% weight of NIMH. Copyright © 2008 Electric Vehicle Power System Technology Co., Ltd(EVPST®).All rights reserved.